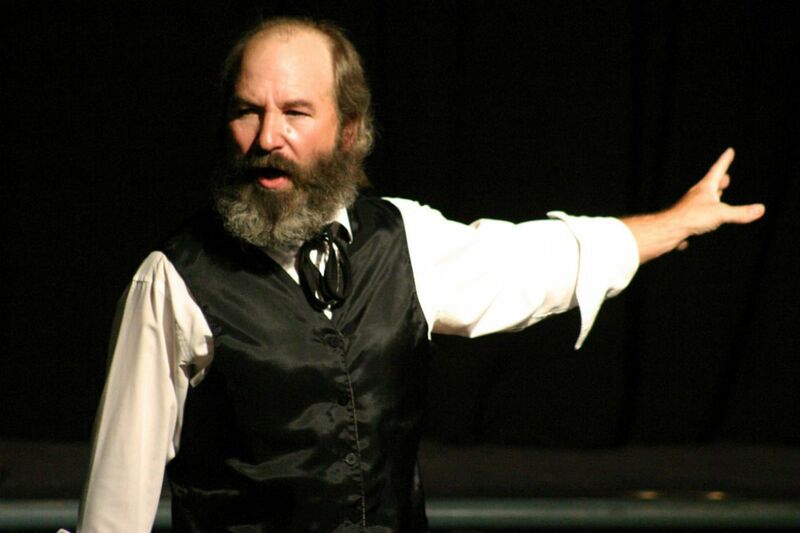 Robert Weick as Karl Marx in “Marx in Soho,” through Sept. 22 at the Philadelphia Fringe Festival. The one-man show Marx in Soho is playing at the Philadelphia Ethical Society through Sept. 22 as part of the Philadelphia Fringe Festival. It isn't really a play at all, but rather a 70-minute harangue. Its premise is that Karl Marx has returned to Earth for one day with the mission to remind us all, but especially Americans, that capitalism is still, as it always was, the enemy of humanity. His rousing cry from the Communist Manifesto — "Workers of the world, unite!" — resounds once again and launches Norristown's Iron Age Theatre's bid to "rebirth" itself in Philadelphia. Marx in Soho was written by Howard Zinn, a famed political activist and one of the earliest voices raised against the war in Vietnam. Zinn was a leading academic and the highly respected author of books such as A People's History of the United States: 1492 to the Present. His passion for a more equitable world is intense, and the show is a ringing indictment of the status quo, of the greed-driven Western world. Robert Weick, who plays Marx, has been touring the United States in this production directed by John Doyle. His performance is also filled with passionate intensity. The theatrical portrait is occasionally amusing as he portrays various members of Marx's circle, including influential revolutionary theorists like Engels and Bakunin and Proudhon. Weick humanizes — and sentimentalizes — the great figure with stories about his beloved wife, Jenny, their children, and especially the firebrand Eleanor. Their hard times spent while impoverished in London's Soho seem self-pitying. If I admire Marx's ideas, I don't find much to admire in the man. Weick's diction is often stilted, and his vehemence seems a cliche as Marx rails against the System, the 1-percenters, the military-industrial complex, Big Pharma, and so on. We've heard it all before. Marx's outrage is the outrage of John Oliver without the humor or the speed or the wit. The author of Das Kapital asks this rhetorical question: "Is there anything more dull than reading political economy?" And he answers it: "Yes there is — writing political economy." If I may I add my two cents: Even duller is listening to a tirade about political economy. Marx in Soho. Production by Iron Age Theatre/ Radical Acts. Through Sept. 22 at the Philadelphia Ethical Society, 1906 Rittenhouse Square. Tickets: $15. Information: 215-413-1318, fringearts.com.